So despite my lack of posts I have been getting in some games. I went up to Frontline for a few games, and I had Anthony over another night for 2 games. We even played a Fantasy game! What we learned is that Fantasy is still just not horribly fun. It is interesting and I think a lot of the 8th edition rules we are 'over' as a lot has changed with 6th edition 40k (random powers, random charges, etc). However overall, whether it be the armies we are playing or the mechanics of the game, it just don't feel like it is a 'fun' application of tactics. You build a list and set up and that is almost the end of the game tactically, now you just roll dice. Units move forward and you decide if you want to risk charging or not. Magic is either unstoppable or, more usually we find, just totally useless. Maybe it is our lack of experience but games like 40k and Warmachine seem to have a lot more to do with what you actually do turn by turn, and because of it are just more fun to play. 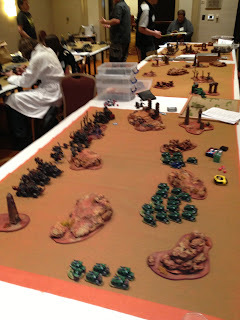 I also went over to do the Dundracon 40k event this last weekend. This was the 1500 event that had no fortifications and no allies. I figured fliers, in particular Helldrakes, would run wild. It turns out not a single helldrake was there! I took the modified bike army, taking the libby instead of the Eldar and adding a Storm Talon to try that out for once. Not a lot of units, multiple objective game. This was pretty much the ideal matchup for my bikes. Things went poorly for him from the get go. He did get turn one to advance but I popped his rhinos and his pred on my turn and put a wound or two on the DP. On turn 2 all he could do was advance. I followed up by shooting him more. By turn 3 I had essentially gotten into one combat and lost, and shot the last of his models off the board by turn 4. This gave me full victory points, which proved to be my undoing. Game 2 I played Mike's Tyranids. Mike is a regular tournament player (last years ETC Team Captain for Ireland) who comes over pretty regularly for work. We've met and spoken at a number of events in the past. His list was everything I don't want to see with my bikes. For those of you counting at home that is 7 guys that can do Psychic Scream. Ya, I did my best to not be negative and make him work for it but this game was lost as soon as I pulled him on table one. Everything went wrong from the get go on top of that. Kill point game and my warlord trait is Captain is scoring. He goes first. Nightfighting. A GIANT F&%K^&G RIVER on the board. But still I gave it the college try. I manged to get first blood on the bottom of 2 killing a spore pod, which was effectively the only wounds I did. By the end of turn 3 I had 6 bikes left and the Storm Talon. He was on me with his entire list also so there was no where to run. Game 3 was against Russ's orks. I've seen Russ at a lot of the Game Kastle events but I don't think we've had the pleasure of a game. I was nice and loose thanks to the two beers, so was ready for a fun game! Russ's list is one I haven't tried, forgive my lack of notating different upgrades because there were lots of small (and largely) inconsequential upgrades. Sorry for the fuzzy picture, I realized I hadn't gotten a snap so quickly did it after my turn one movement. Things in this game started out pretty good. Despite night fighting I managed to steal the intiative and kill his Manz and his Warboss rides on turn one. The problem was the both Kareened straight at me. This meant I not only had to deal with those squad, he was able to apply preasure with the other trukks as well. I thought the game was still going pretty well, but his Lootas were on fire. The two squad I think only managed to roll 1 shot once in 10 rounds of playing. Despite my Captain making a ton of 2+ saves things went really south for me when he went down. By the end of turn 5 I think I had one squad of two bikes left, and he still had a good clip of boys wandering around the table. Mike from my second game went on to win the Best General. My team mate Grant was the other 3-0 player with his Jetseer Eldar list but just couldn't muster the cremations to rack up the VPs like Mike was able to do. 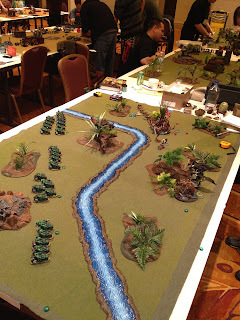 The guys that ran the event (the Waagh Club that does the Grant Waagh tourny) ran a smooth event and have really stepped up the terrain since the last event I went to that they ran. Since the Con doesn't kick down prize support the generously gave away a table full of terrain to the Best General, Best Painted, and Best Sportsman. I thought that was a pretty nice and different way of doing the prize support. So what did I take away from this event as it relates to my biker marines? 1. Bugs rule. I've been beaten by Reece's bugs twice in recent memory and now the shellacking from Mike. I think most armies will struggle (maybe not GKs?) but in particular my bikes. It particularly hurt not having the farseer, but even with the farseer I'm not sure it is enough. 2. I didn't miss the scouts and quad gun. Game 2 it might have been helpful to shoot down a Flyrant, but I shot with all my bikers at them and he made every 'don't fall down' save. So what are you going to do there. There were no fliers in my other two games. There were one or two Necron armies that had a number of fliers, but most lists didn't field any. 3. I've been working on a Drop Pod and Sterngaurd for BAO. While they would have been helpful in game 1 (which I didn't need them) and possibly game 2 (though probably not enough to change the outcome), they could have been game changing against the orks. 4. The Storm Talon was near useless. In game 1 I had effectively taken out the armor except his LR., which the Storm Talon I think did manage to immobilize. Still not the best target. Game 2 I was pretty much already dead by the time my Storm Raven got on the field. Game 3 it game on and blew up a truck, then got downed by lootas. All in all that was 150 points better spent on just about more bikes (be it MM attack bikes, more scoring bodies, or points toward the Eldar in another tournament). So it is two weeks until the BAO. I've got to wrap up the drop pod/sterngaurd project and figure out if I get those Eldar in there or not. They are always nice, but in most games don't feel worth 200 points. They can really damper the Tyranid pyschic shock and awe but I'm not sure it is quite enough in a list like Mike ran (plus 250 more points to spend) to pull out a victory. Hopefully I'll get one or two more practice games in but with so much painting to be done we'll have to see.